It’s a golden delicious time down here by the river as Apple decides to locate its core UK activities into Wandsworth Borough in the re-imagined Battersea Power Station. As our politicians … councillors, MPs, Mayors, Cabinet Members – seek to pat each other on each other’s respective backs, so do we, the local citizens, have reasons to be cheerful as well. Our already pretty good transport links will only improve … let’s go for an extension to the extension of the Northern Line underground service from Battersea Power Station into Wandsworth Town via Battersea High Street, let’s campaign for a new Thames Clipper stop and an all day, 7 days a week riverboat service, let’s get TfL thinking about re-routing Crossrail via the finally developed Power Station site and Embassy Zone. 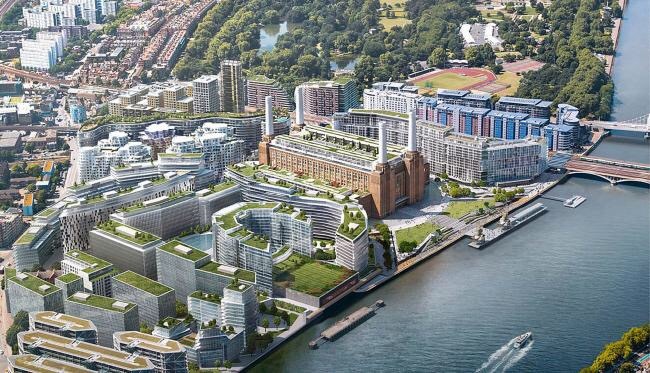 So here’s to Silicon River and Formula A – welcome to Battersea. WE LET THE PEOPLE SCREAM …. And at the moment it’s probably ‘Help! Help!’ here on the riverside, just beyond our much-loved Wandsworth Bridge and Brady’s fish emporium towards Putney on Nickol’s Walk … when not only has their belovèd one tumbled into the Thames, but also they’ve suddenly realised that the trusty wooden life-belt that they imagined would be there is not actually there. But fear not …. 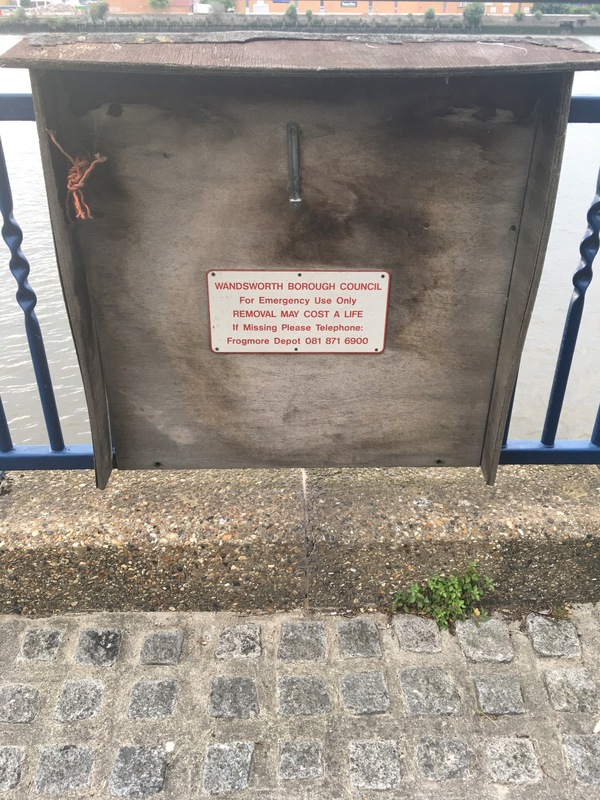 once they’ve recovered their aplomb or their paramour or from their tragedy – or a combination of these – then they can always report the life-belt to be missing by calling Wandsworth Borough Council on 081 871 6900. THE WANDSWORTH VOICE has been campaigning for the last couple of years about the parlous state of Wandsworth Bridge. And the local authority’s total lack of action in terms of repairing and refurbishing it. Both in terms of its basic fabric and its almost total lack of lighting. We are not alone in asking our council to do something – and quickly. Accordingly, we are very happy to bring to our numerous readers’ attention a new petition, started by the residents of Battersea Reach. Local residents disagree. In their eyes, it has history and character and adds to the riverscape, especially in the hours of darkness when it is flood-lit – or, at least it was until about two years ago when it fell into total darkness after barges damaged its electric cabling. 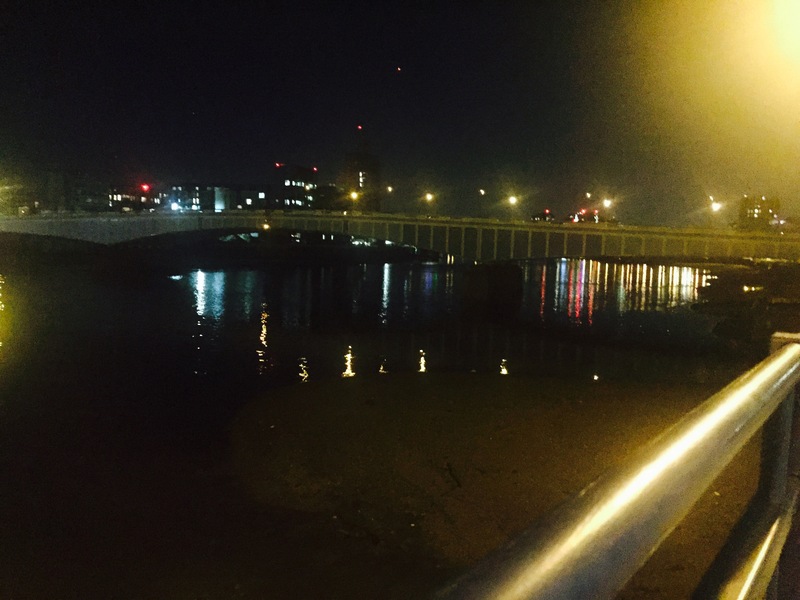 The Wandsworth Council says it might get around to replacing the flood lighting in two years time. Until then, the bridge will have to remain shrouded in ominous darkness and maintain an air of despondency for all. It is unfortunate that the planning consents (Wandsworth application 2005/3442 and Fulham & Hammersmith appeal APP/H5390/A/07/2033961) lapsed. These were for internally illuminated glass cones rising to 10 metres from the plinths on each end of the bridge which would change colour to correspond with the height of the tide. The consents recognised that the lights would be a feature in the regeneration of the riverside sites. Why is Wandsworth Bridge excluded? What has the Mayor got against Wandsworth Bridge? Why should it be left in the dark? Why is the Wandsworth Council not a participant in this project? WE LET THE PEOPLE TALK …. and when they do it’s terrific that their voices are heard. 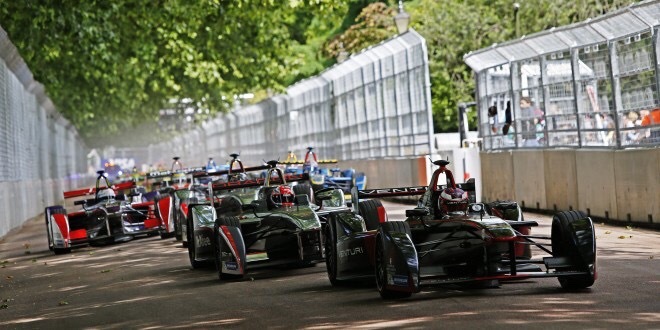 THE WANDSWORTH VOICE has always made it very clear that it was against the Formula E motor race being held in that most noble of open spaces, Battersea Park. The event will NOT be taking place next year in Battersea Park and maybe not at all in London, if Señor Agag and crew don’t achieve their stated ambition of now running the event up and down the Mall, around the Buckingham Palace Garden, in front of Westminster Abbey and starting and finishing by a specially re-painted Cenotaph. And whilst Señor Agag is not particularly gracious in ‘defeat’, he does acknowledge that not being able to ‘see the cars for the trees’ is not the perfect recipe for success and audience participation in a spectator sport. The event will still take place this July in Battersea Park – so the ‘victory’ of The Battersea Park Action Group is not total … but nor is it hollow. And your writer is pleased to have been a late-joining member of the group, whose staunch efforts have all been rewarded – ranging from case-making and letter writing to ejecting unwelcome/uninvited local politicians from a group meeting – all in all, they clearly did a jolly good job. For those of you who are really interested – here’s a formal up-date from one of the few media sources who have shown a modicum of interest in this sorry, mal-placed event. A final thought …. we wonder what Murray Walker would have had to say about all this … perhaps he has said something – if so we’ve missed it. He’s clearly the chap for the Battersea procession. 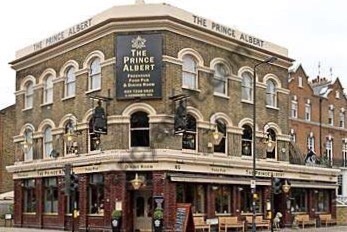 Our reviews of quite-close-to-the-Thames-hostelries-in-the-Borough-of-Wandsworth continue with The Prince Albert – which, unsurprisingly and eponymously, finds itself on the Albert Bridge Road by Battersea Park, just by the Albert Bridge, only a few miles due south of the Royal Albert Hall and the Albert Memorial … and of course at a strolling distance from Albert Mansions. Again, as with many of our riverside gin-joints, its very location deals The Prince Albert a winning hand – especially if you like Bridge. Or quaintly enough, if you play backgammon. The Battersea Backgammon Brigade appear to be permanently ensconced as they crash, bang and wallop their ‘counters’ around the board. Oblivious to such naïve counter-attractions as a ‘Quiz’ they resolutely strive to counter being ‘gammoned’ or, heaven forfend, counter-attack in order to avoid suffering the ignominy of being ‘back gammoned’. It’s a Geronimo managed house … and in addition to its fine range of beers and first-rate jugs of highly flavoured tomato juice it offers fine fodder …. Gastro-this and Gastro-that … we are spoiled indeed – perhaps it should now be known as a ‘Gastronimo‘ house, such are its culinary delights! Our readers may well ask … ‘Surely there must be some irksome downsides?’ Well there are … but only really a couple …. for this crusty old codger, there is a preponderance of perambulators perpetually pushed and pulled by Prosecco-pouring parents during the day. Service is well up to local standards so overall its rating must be 8 out of 10. To see what they say about themselves have a look at …. 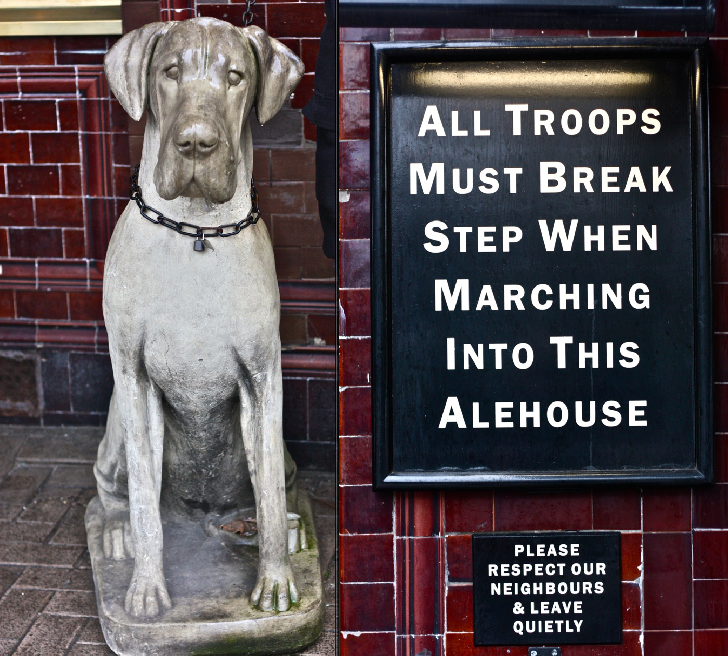 And of course it does boast one of the best pub signs in London ….